The women’s basketball team is building relationships with Allegheny faculty through its faculty mentor, Kristen Webb. In addition to her role as a faculty mentor, Webb is an assistant professor of biology. Webb meets with each player one-on-one to get to know each athletes’ academic interests. Webb also attends two practices a month, attends the majority of home games, sitting behind the bench and will be travelling to one away game to experience what that is like for Allegheny student athletes. “[She] acts basically like an academic adviser for the team. As a former collegiate athlete she understands what it’s like to be in our shoes. She also helps out during some practices throughout our season,” said Iffie Uwazie, ’16. Head Coach Kate Costanzo said it shows the team the importance of academics and perception of co-mingling academics and athletics, bringing a professor to the sidelines like you can bring an athlete into the classroom. Dillon chose Webb to be her academic adviser as well. Dillon added that Webb is a resource the women can go to if they have any academic questions or concerns. “Since she is a professor in the biology department and many members of our team are biology majors or on the pre-health track, we can ask her major-related questions and some of us, like myself, may even have her for a biology class,” Dillon said. Webb also meets with the team’s recruits, has them sit in on her classes, and shares what it is like to balance academics and athletics. Costanzo said she got the idea to have a faculty mentor for the team from her brother, who is a professor at Mount Aloysius College. “He got interested in it, as an English professor and mentor for the cross country team. The teams have a professor that is interested in getting outside the normal classroom. He has done research on faculty mentors in DIII athletics and hopes to write an article, and he motivated me to get a faculty mentor for my team,” Costanzo said. Costanzo added that the basketball team is not alone in having faculty involved. Other teams have faculty involvement but without a title or commitment. “She helps keep us on top of academics and is a valued fan in the stands. We all get some encouragement to keep working hard when we have people checking in on our progress and [she] provides that. As a professor she cares about our academic success and from the position of women’s basketball faculty mentor she’s always there for us,” Uwazie said. The women are looking forward to the 2015-16 season, and began offical practices Thursday, Oct. 15. “I am looking forward to playing with my teammates and seeing how we can improve as basketball players, both individually and as a team. We have 10 new members of our team this year, so I think the addition of the new team members will really help us,” Dillon said. Uwazie said she is excited about playing with so many great teammates this year. “I’m lucky to have 18 extremely talented and all-around great ladies on the team with me and I’m looking forward to seeing us all work together towards a successful season,” Uwazie said. The team is hoping to compete in the conference championship this year. “We want to win more games than the past few years, and while I say that, our theme for the year is the year of positivity. 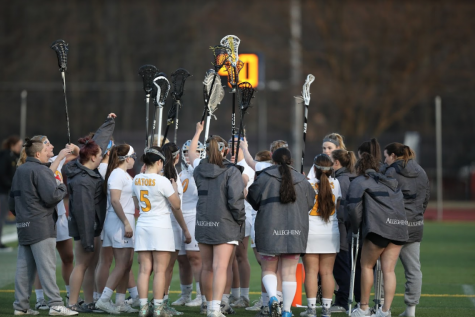 We are hoping to be surrounded by positive culture, we have a great group of women buying into positive outlook and we are looking forward to seeing more results with a good outlook in a long season,” Costanzo said. The team’s first game will be November 13 at 7 p.m. at Saint Vincent College.